Four Tips on How to Stick to Your Budget during the Holidays - WELCOME TO THE FRIENDLY STATE OF OKLAHOMA!! Making travel plans at the last minute is one of the most expensive ways to travel. Airline tickets skyrocket the closer you get to a departure date, particularly around Christmas and New Year’s, when overall travel volume spikes. Instead, make your travel plans early or don’t travel at all. Leaving yourself some room can do wonders for your bottom line. Scan travel sites daily to catch the best deal possible, and when you spot a cheap ticket, book it fast before prices rise. Whether you’re expecting just the kids or hosting a large family gathering, it is tempting to want your house to look like the pretty images on Pinterest, but resist the urge to splurge on too much holiday décor. A carefully chosen wreath or centerpiece isn’t too costly, but going all-out on holiday decorations can be a major strain on your budget. Instead, find one or two items that really pop to get you through this year’s festivities, then keep an eye on post-holiday sales to get an additional piece or two at rock-bottom prices for next year. Singlehandedly serving a holiday feast can be satisfying, but only if it doesn’t break the bank. Whether it’s lunch with your extended family or dinner with your closest loved ones, holiday meals can quickly add up. Many people hesitate when friends and family offer to bring a dish to share. After all, if you’re hosting it’s your duty to provide the meal, right? Wrong! Not only will sharing the load help control your food budget it will also give your guests the satisfaction of contributing to the party. Everyone loves to feel useful, and allowing a guest to bring a dish to share is a great way to give that gift to someone while also reining in the cost of hosting. If you’ve seen any TV commercials during the holiday season, you’ll know just how desperate businesses are to get you out of your house and into their stores. The weeks following Thanksgiving are some of the busiest for retail stores and movie theaters alike. Between special holiday sales and big holiday blockbusters, it is incredibly easy to blow your entertainment budget before you even know what happened. If you have kids or are hosting friends, think ahead about alternative entertainment that will keep the bill low. Try renting a movie or finding something on Netflix instead of taking the group to the theater. If you’ve got the itch to shop, be sure you absolutely need whatever you’ve got your eye on. 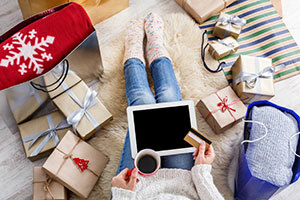 Don’t let the holiday sales ads choose a budget for you. Take control and only look at sales when you already know what you are about to buy.